If your order weighs less than 13 ounces, save huge on shipping with USPS first class (with tracking number). This product weighs 6.8 oz. 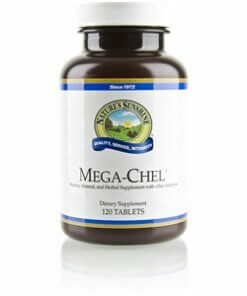 Nature’s Sunshine Mega-Chel blends nutrients that support circulatory as well as total body health. The formula includes 11 vitamins and 10 minerals. Vitamin A, vitamin C, vitamin D, vitamin E, vitamin B complex, calcium, phosphorus, iron, zinc, selenium, and manganese among others are some of the essential nutrients that make up this formula. Each ingredient is conscientiously chosen to provide peak benefits and easy absorption. 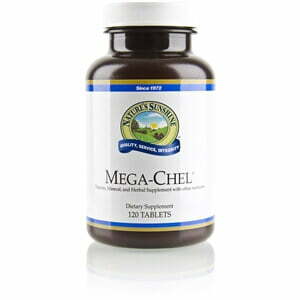 Mega-Chel is natural and yeast-free. Instructions: Begin by taking one tablet twice daily for one week. Then take two tablets twice daily for the second week. Gradually increase to four tablets with a meal twice daily. Maintain this level for three to four months. Then gradually taper off in a similar manner. Stearic acid (vegetable), cellulose (plant fiber), magnesium stearate (vegetable), magnesium silicate, citrus bioflavonoids, Rutin, silicon dioxide (powdered silica), Adrenal substance, Spleen substance, Thymus substance, cod liver oil (from fish), Ginkgo leaf (Ginkgo biloba), and Hawthorn berries (Crataegus oxyacanthoides).